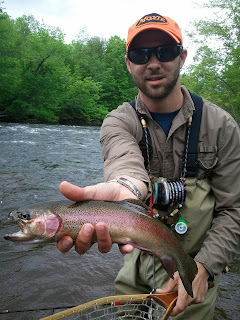 Wild River Angler: It's All Good! It's been a while since we did and update... and that's because the fishing has turned on in a big way! It was bound to happen, the rivers dropped, water temps are hovering near perfect, and this week's forecast is calling for more cloudy and cool weather to keep things in the 'happy place'. We have seen some absolutely epic days in the past week. It's not all about stacking up body counts, but nobody complains when there are a lot of bent rods throughout the day. The calender is jammed up until mid-July, so if you are going to be around this summer and want to get out and feel the tug then shoot us and email or give us a ring and we can plan something out. That dude knows how to catch fish (and that is a sweet hat). Dudes with lippers and Moxie hats are generally bad news for trout. Yes, you too can tangle with Maine's hardest pulling game fish. Guaranteed to wear your arm out.